In January 2017 Videocardz.com published an off-quoted but never confirmed set of slides detailing the features of AMD's Vega series GPUs. Not only did they spill the beans on Vega 10 - later known as RX Vega64 in consumer markets - but also outlined some of the capabilities of Vega 20. Fast-forward 18 months and Vega 20 is very much on the horizon, with AMD heavily teasing it during Computex 2018 and a distinct gearing up for a launch sometime in the second half of 2018. And in that vein, one curious footnote in those original slides appears to now be supported by new evidence. 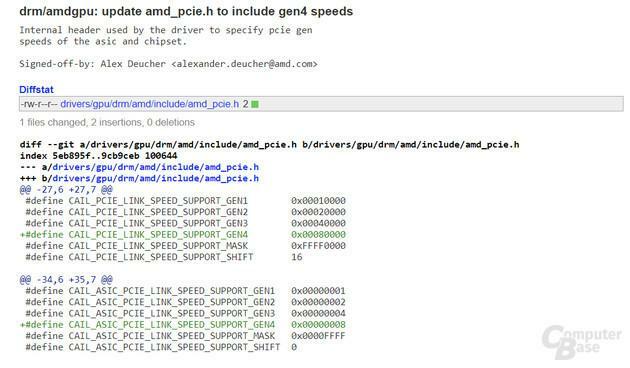 As reported by Computerbase.de, AMD's latest Linux driver contains references for PCI-Express 4.0 support. While this does not refer to any specific GPU, it's assumed that this addition is paving the way for Vega 20 support in the near future. PCI-Express 4.0 support was one of those features mentioned in the Videocardz slides, but was overshadowed by more significant improvements such as the transition to 7nm manufacturing processes. PCI-Express 4.0 roughly doubles the available bandwidth per PCIe lane to almost 2GB/s, but just as with PCI 3.0 before it GPUs will struggle to saturate this connection. One application for the technology however is in diversifying attached devices, particularly NVMe storage and networking capabilities, which would be a boon for both server environments and lane-starved desktop systems. The new standard is not yet supported by Intel or AMD in any released product, and that may remain the case for some time. However another feature of PCIe 4.0, backwards-compatibility, will mean that it won't cause any problems for Vega 20 as/when it launches as AMD's Radeon Instinct platform.